We’ve been really excited about this interview but due to the current events Egypt has been going through we had to delay it. We don’t want to sound very cliché by saying “better late than ever”, but that’s pretty much the case here! We’ve been very lucky to have an interview with Mohamed Famhy (a.k.a Ganzeer) and it is time for this interview to see the light! notice: since people have been dividing the history of Egypt into 2 eras (Pre-Jan 25 and Post-Jan 25), we would like to inform you that this interview is Pre-Jan 25. - How did you start getting into illustration and graphic designing? Ganzeer: Well I grew up reading comic books, and pretty much just trying to copy the awesome art in their pages. Although comic books are a particular passion of mine, and its something I would definitely love to do, to make, I’m also equally interested in graphic design. This interest of course came a lot later, during my last year in business school. But trying to analyze my interests, why I like comics so much, and why I eventually grew to love graphic design is… well I think has a lot to do with communication. There’s something incredibly expressive about comics. The characters, their reactions, their faces, their body language. The way comics are laid out and how you can use that for even more expression. The lettering (typography) and what you can do with it. The colors. The dialogue and stories. All of this just made me interested in communicated ideas and how you can affect someone in their hearts using a variety of mediums. So yeah, graphic design, I think I first started learning it out of necessity, because during my last year in college, I noticed how a lot of artists I admired had websites, so I figured it might be a good idea to create a website to put my sketches on. So I had to learn web design, which, of course, involves graphic design. It was horrendous, but I eventually got offered to design a logo here and a brochure there anyway, and things just evolved from there. - Why “Ganzeer“? And how did the “Ganzeer” idea get established? Ganzeer: When I first started Ganzeer, I had intended on putting together a multidisciplinary design collective. “Ganzeer,” is Arabic for bike chain, which is a series of stand alone metal parts, when connected, they make a whole, and together as a whole they are able to connect gears together to keep them moving. It made sense to me at the time, but what happened later was that the whole collective thing never really worked out and I ended up working at Ganzeer all on my own, so the name just eventually became associated with me, and I just went ahead and adopted it as such. - What are the things that inspire you? - What is it like to be a Freelancer? Ganzeer: It’s like having a dozen different jobs at the same time. You’re the designer, you’re the manager, you’re the sales man, accountant, production manager, secretary, and office boy. It’s tough. But then again, working with people can also be tough. - You were recently in Noord, Netherlands, working on a project. Can you tell us a little bit about this project and how did you get the chance to participate in it? Ganzeer: Although Amsterdam Noord is part of Amsterdam, a lot of Amsterdammers don’t really consider or treat Noord as such, so it’s quite an interesting situation for the Dutch. I, along with many other artists, was invited to do a project on Noord. I ended up doing what I titled Noorderlijk Character(istics), which was basically a series of maps of Noord, each map for a different date. The official neighborhoods of Noord were illustrated as characters, each character visually representing the “character” of each neighborhood. Basically using the art of character design as a mapping tool. How I got the chance to participate; well a couple years back, Independent Dutch curator was Nat Muller was a resident at the Townhouse Gallery and had a chance to live and work in Cairo for a while and thus meet a lot of local artists. So when she dreamed up this Noord project and pitched it to Mediamatic, I was one of the chosen artists considered for participation. - What was your best experience while participating in a project? And how different is working on art by your own from participating with people? Ganzeer: Well in this case, there was a central topic for all the artists to work within, that topic being Noord. But the topic is so vast that there’s so much to do, and each artist was pretty much working on his/her own, so it wasn’t really much of a collaboration, although it wouldn’t have been possible without the many researchers and “show builders” made available to help out with anything the artists needed. Still, it’s quite different from collaborating on a project with different artists, which I haven’t had a chance to do a whole lot of, but would definitely love to do more of. - Are you working on any projects right now? Or are there any “Ganzeer” projects coming soon? Ganzeer: Commercial projects aside, I think the most relevant thing I’m working on now is a screen-specific Arabic typeface project in collaboration with friend and designer Gaber. - If somebody thinks he has some kind of talent, what do you think he should do? Ganzeer: I guess they should hone their craft. - Do you think art can touch/affect people? (if yes) In what ways? Ganzeer: It can make people think, laugh, cry, or scream. It can amaze people, shock them, or amuse them. Just like a good comic book, song, or movie. - What are your goals and dreams? Ganzeer: I dunno anymore, man. I’m kind of in an odd, undefined, meta sort of state right now. - You’ve traveled to different places and countries to work on projects. What do you think about the state of art in Egypt? And how is it different from other countries (Arab and non-Arab)? Ganzeer: To sum it all up, I think Egypt has a lot of material to create art about. There’s just so much to tackle. I’m not sure if the same necessarily applies to other Arab countries, since I haven’t had the chance to visit many, but I didn’t feel it was the state in some of the European countries I’ve visited. Although there seems to be a lot more room out there for creativity and creating in general. - Do you think art can play a role in improving Egypt? Ganzeer: I hope so, man. I really do. Otherwise, I’ma have to make a drastic career change. We would like to thank Ganzeer for his time and for giving us this opportunity! We can already see art changing Egypt to the better, and we are pretty sure he will play an important role in this change. Back in the days, when City Stars was a brand new mall, do you remember that t-shirt printing shop downstairs that had drawings all over its walls? No? Well never mind. Have you ever been to Euro Deli in Heliopolis? Nope? Never mind again. These mentioned places, are just places where Ganzeer‘s work can been seen all over their walls. Ganzeer, or Mohamed Fahmy, is an Egyptian visual artist with a very distinct and unique style of drawing. What makes him stand out of the crowd is the Egyptian twist that can always be found in his illustrations and the various styles he uses in his work. 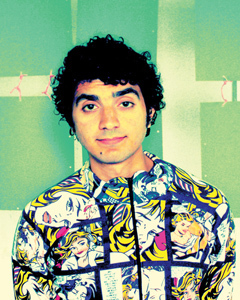 He has done a lot of designing work for magazines, events, projects and musicians. We are going to be shedding some light on some of his most distinctive work but if you want the full picture, from the man himself, we encourage you to go check out his blog. He is currently working on a new website that is going to be released very soon, but his old outdated one; which also has a lot of his work, is still up for viewing right here. We will surely cover more of Ganzeer‘s work in upcoming posts, for now, enjoy these! A group show called “Why Not?”, featuring up to 45 artists, took place at the Palace of the Arts at the Cairo Opera House on February 2010 featuring up to 45 artists. Ganzeer‘s corner, Slip of the tongue/زلة لسان, was one of the most notable ones at the show that it was featured in the Egyptian publication El Masry El Yom. You can check out Ganzeer‘s paintings from the exhibition right here. 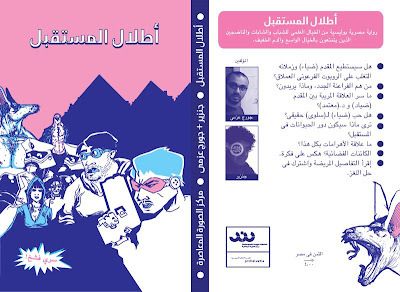 This is an 80-page piece of sci-fi graphic novel that takes place in Egypt, created by Ganzeer and George Azmy (yes, the stand-up comedian…he draws too). Unfortunately, we could not get our hands on an issue so we can read it and tell you more about it but we can tell from these snaps that the novel has Pharaoh robots, guns and shooting, which can only mean…awesomemess! This illustration by Ganzeer, criticizing the behavior of the Egyptian people in the holy month of Ramadan, was featured a couple of years ago in E7na Magazine. It is a great example for Ganzeer‘s unique drawing style (with that Egyptian twist we talked about earlier) and characters design.